On November 8th, GQ Gentlemen’s Quarterly celebrated the 20th anniversary of the GQ Men of the Year Awards at the Komische Oper in Berlin in Berlin. 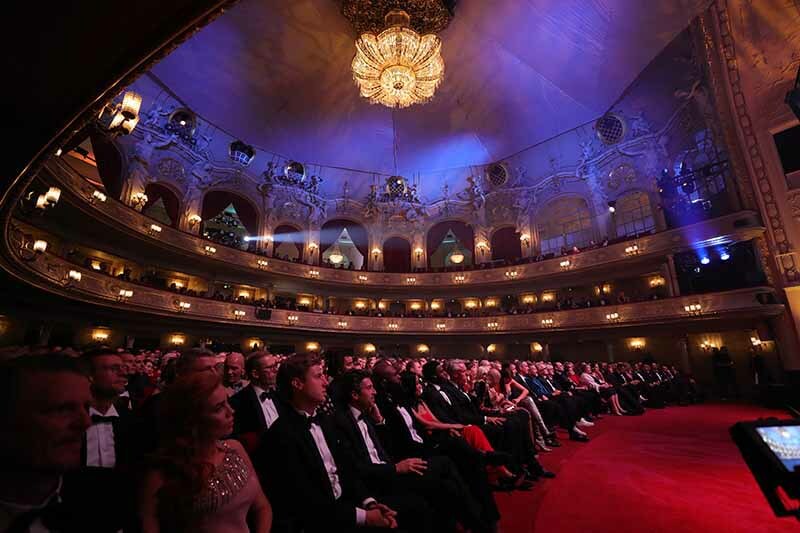 Ten categories were presented at the glamorous gala, awarding both national and international stars from show business, the music and fashion industries, as well as from sport and culture. The approximately 850 invited guests were entertained by presenter Barbara Schöneberger. Her trademark humor and wit entertained the audience throughout the award show, which was filled with high emotion. The musical entertainment was kick-started by actress Severija Janušauskaite, who sang her mystical hit “Zu Asche, zu Staub”, acclaimed theme song of the series “Babylon Berlin”. Football world champion Bastian Schweinsteiger, accompanied by his wife Ana Schweinsteiger-Ivanovic, was there to receive the “Sports Icon” award for his outstanding sporting achievements. The actors of “Das Boot” were honored in the category “National TV”. Franz Dinda, Stefan Konarske, August Wittgenstein and Tom Wlaschiha came to accept their award. The live premiere for Herbert Grönemeyer’s new album / Fashion Awards for Donatella Versace and Dries van Noten. After a moving premier live rendition of his new song “Bist Du Da”, Herbert Grönemeyer was awarded the title “Legend” by GQ editor-in-chief Tom Junkersdorf, with the audience honoring him for his exceptional career and social commitment. The fashion category also featured prominent awardees. The style magazine GQ named Dries van Noten “Designer of the Year”. The appearance of exceptional designer Donatella Versace was another highlight of the star-studded evening. Russian supermodel Irina Shayk paid tribute to her in a laudatory speech, honoring her as a “Fashion Icon” for her many accomplishments in the international world of fashion over the years. Another reason for Donatella Versace’s special role during this event is the Versace creative team’s design of GQ’s 20th anniversary-trophy, showing off the characteristic GQ letters in a distinctive Versace design. The GQ Men of the Year Awards were hosted by Moritz von Laffert, President of Condé Nast Germany, the Editor-in-Chief Tom Junkersdorf and GQ Publisher André Pollmann. show, which is hosted in twelve different countries worldwide. Highlights, interviews with the awardees and presenters, as well as extensive background info and videos, can be found on www.menoftheyear.de, or on GQ’s social media channels (Facebook, Twitter, Instagram / #gqawards).